Today we Ul 3071 Cable Wholesaler come to summarize Aluminum alloy rod continuous casting and rolling process. 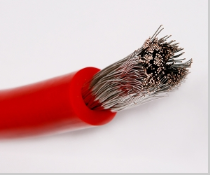 If you have any idea about Ul1015 Cable, welcome to contact us and discuss. The excellent aluminum alloy conductor rod is the decisive factor for the electrical and mechanical properties of the aluminum alloy cable. The stable production of the aluminum alloy rod that meets the requirements is mainly from the following links. 1) Calculate and determine the number of aluminum ingots, intermediate alloys and additives. After the materials are melted into the holding furnace, add additives to refine and stir. At the same time, sample and analyze the different points in the furnace and adjust accordingly if necessary. 2) Due to the high temperature after alloy refining, the crystallization of aluminum liquid is difficult. Pay attention to adjusting the cooling water pressure at any time to keep the crystal wheel smooth and clean, so that the aluminum liquid can be crystallized smoothly. 3) Strictly control the tensile strength and elongation of the aluminum rod during rolling to facilitate the subsequent pressing and stranding process. Because the aluminum rod has internal stress, it can be stored for more than 48 hours.